For guests who plan to check-in on 30 and 31 December, a minimum 3 night’s stay is required to make the booking. Look sharp and feel your best with a minimum 2-night stay in our Deluxe room or Premier room during your next business meeting in Jakarta. As a special VIP perk, you'll receive complimentary laundry services for 2 pieces of clothing each day during your stay, as well as complimentary daily breakfast for two, unlimited WiFi, and late check-out when available. This offers valid until 30 June 2019. Look sharp and feel your best with a minimum 2-night stay in our Deluxe room or Premier room during your next business meeting in Jakarta. As a special VIP perk, you'll receive complimentary laundry services for 2 pieces of clothing each day during your stay, as well as complimentary daily breakfast for two, unlimited WiFi, and late check-out when available. This offers valid until 30 June 2019. 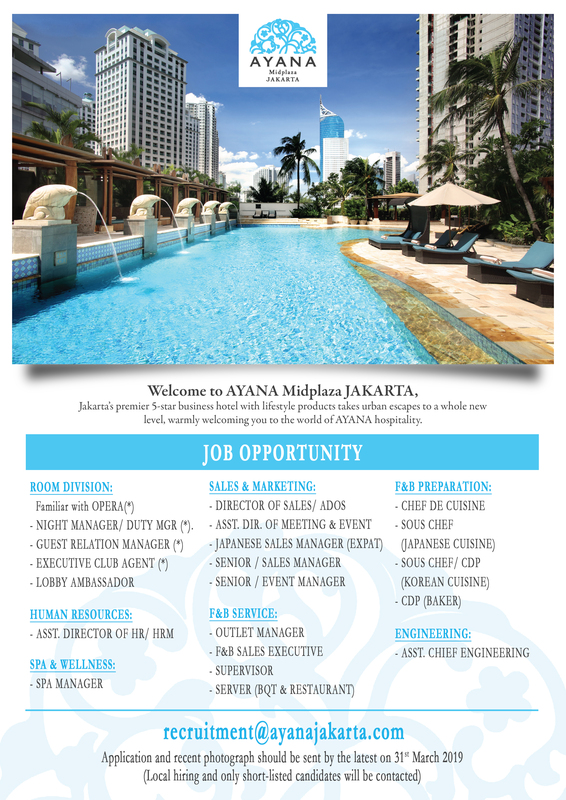 Be the first to know about AYANA Midplaza Jakarta's exclusive perks, events and promotions!